Posted by Dena Eytan on Wednesday, January 31st, 2018 at 10:27am. 1. A legacy property in The Colony: This property is so special. 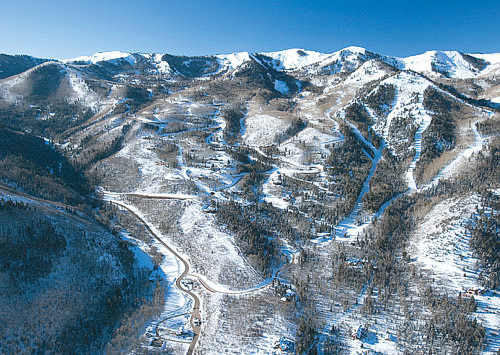 The lot is large and private; nestled in the trees with fabulous ski access. The owner decided to simply build a guest house...but if you wanted to build a large Main House, you can do that. There is an oversized 3 car garage that has an apartment above. The property currently can sleep 20 people. 2. The Lofts at Deer Valley Drive: Incredible location on Deer Valley Drive...walking distance to both Main St. and Snow Park Lodge. On the bus route. My favorite aspect of this townhome is the rooftop space...perfect spot for cocktails in the hot tub after a day of skiing! 3. Shooting Star 304: The best value in all of Empire Pass. This 2 bedroom on the third floor of Shooting Star in The Village at Empire Pass in Deer Valley, looks towards the Silver Buck Ski Run and is being sold furnished with the full Talisker Club! 4. Ironwood: This is a ski in/ski out townhome in the Northside neighborhood in Empire Pass. Lives and entertains beautifully. 5. Chatham Crossing: This 2 bedroom townhome was recently reduced in price. Great in town location steps away from The Rail Trail. 6. Nevis at Newpark: Fantastic 2 bedroom in Kimball Junction....close to everything wonderful at The Junction: restaurants, shopping and entertainment.